I’m back from my three-week trip to Russia, with news for you on the new lunchtime incarnation of Duna (Smokebread), the latest chef-inspired cocktail menu at Trick Dog, a Benedict brunch, the new Tappy Hour at Barvale, and read about some of my favorite healthy lunches (or dinners) at Booster Foods, especially after being on the road. 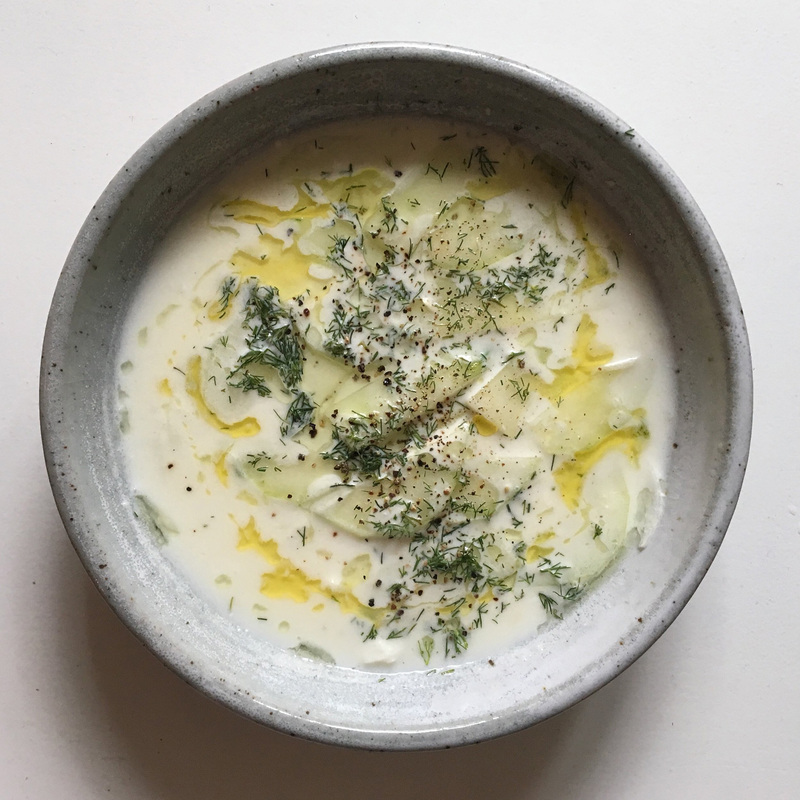 Duna has sadly closed on Valencia—the short-term rotating restaurant project from Nick Balla and Cortney Burns (previously Bar Tartine)—but fortunately Nick Balla is continuing the spoon salad tradition and more as a lunchtime pop-up, Smokebread. He’s offering lunch in the bar area at Mid-Market’s The Perennial restaurant, Tuesday to Friday from 10:30am–2pm. You can choose from juicy salads like the Sofia (tomato, cucumber, olive, feta, pickled beans, marjoram vinaigrette), the Duna (salami, pepper jack cheese, tomato, mushroom, pepper, red wine vinaigrette), the Taketa (Japanese sweet potato, broccoli, avocado, fennel, sunflower tahini, sprouts, and seeds), or a sausage and lentil stew—perfect for our foggy summer—with chicken broth, greens, sprouted lentils, apple cider vinegar, chile, yogurt, and dill. They all come with Balla’s latest incarnation of the namesake smokebread: this time it’s a pan-baked version of his smoked potato and sourdough flatbread, and perfect to dunk into the salads’ vegetable juice–based vinaigrettes. There are also dips and sides, and the option to make things gluten-free or vegan. Everything is healthy, savory, peak season, and begs for a glass of rosé. Delivery is coming soon as well. Balla is pleased to be reunited with friends and owners of The Perennial, Anthony Myint and Karen Leibowitz—they have collaborated many times over the past 10 years. It’s worth noting that Perennial chef Michael Andreatta will continue to lead The Perennial’s kitchen, with a bar menu that starts at 4pm and dinner starting at 5:30pm. Looking for a new happy hour? How about a nightly one? Sí! The popular Barvale on Divisadero has launched “[Tap]py Hour” (from 5:30pm–6:30pm) in the bar and lounge. 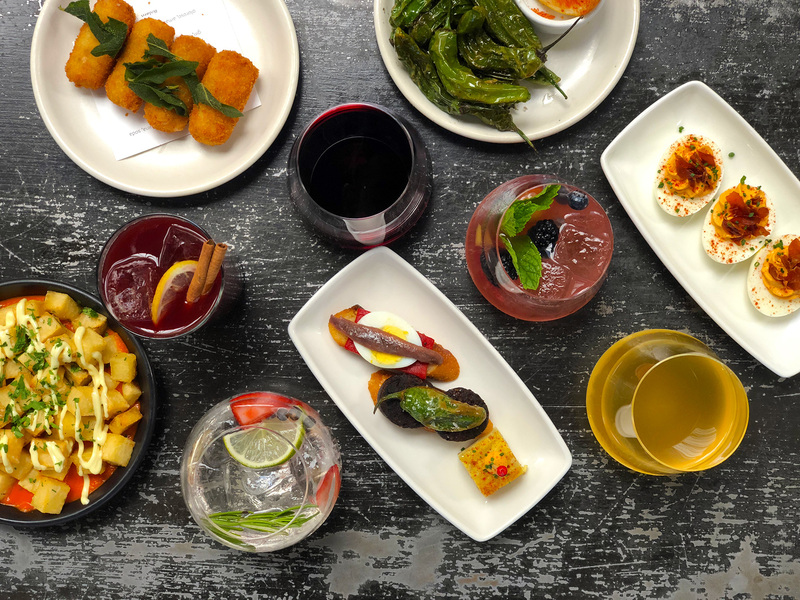 You can come by for $6 drinks on tap (ahhhh, now the name makes sense), like their Gin & Tonic #1, sangria, kalimotxo, sidra, and Spanish wines by the glass. There are also $6 tapas: croquetas, patatas bravas, pimentos, and huevos diablos (3). One more bonus: there are also complimentary pintxos. The tricky spot is finding a seat, suerte! 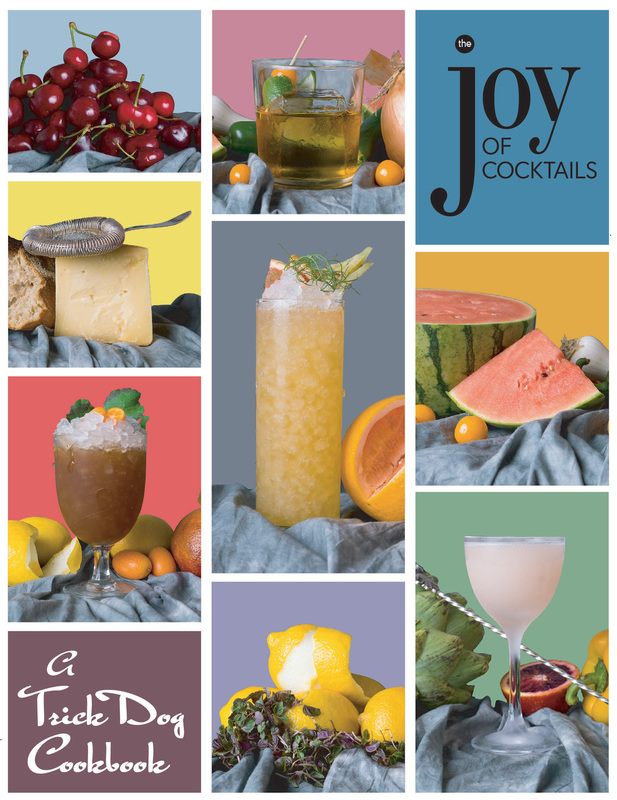 The Trick Dog bar team keeps on surprising and keeps on pushing with their rotating cocktail menu series, and this time they have unveiled The Joy of Cocktails: A Trick Dog Cookbook, a collaboration with top SF chefs. The cocktails were created in collaboration with chefs Dominique Crenn (Atelier Crenn); Gabriela Cámara (Cala); David Nayfeld (Che Fico); Craig Stoll (Delfina); Tom McNaughton and Ryan Pollnow (Flour+Water); Traci Des Jardins (Jardinière); Ravi Kapur (Liholiho Yacht Club); Brandon Jew (Mr. Jiu’s); Kim Alter (Nightbird); Melissa Perello (Octavia); Evan and Sarah Rich (Rich Table); Stuart Brioza and Nicole Krasinski (State Bird Provisions); and Angela Pinkerton (Theorita). 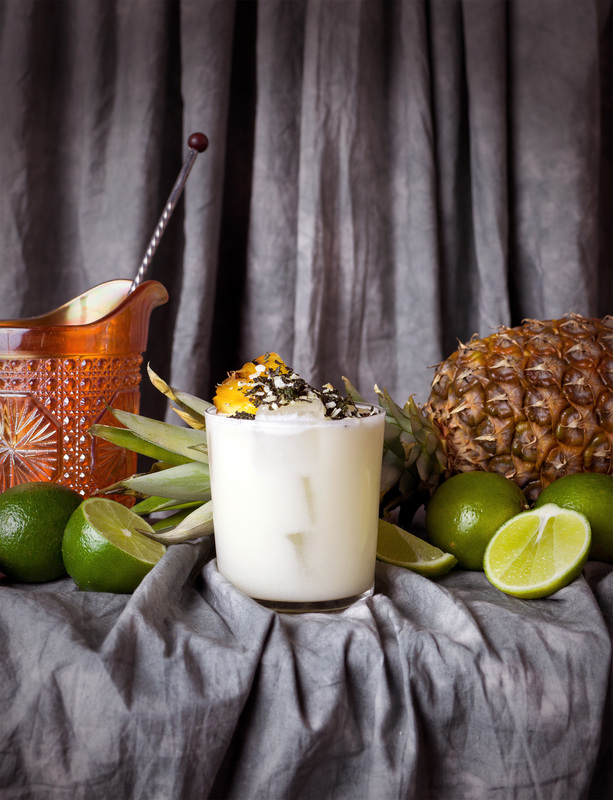 For example, Traci des Jardins’s cocktail features duck fat–washed Tequila Ocho reposado, Lecompte calvados, Bigallet China-China, Hidalgo Manzanilla sherry, tomatillo, and passionfruit and chile bitters. The Trick Dog team worked with the same farmers and foragers the chefs use for the cocktails, and made all ingredients in-house, including a coconut “furikake” and a housemade liqueur that combines elements of amaro, limoncello, and nocino (wowza). Something to note: this limited edition cookbook and menu are not endorsed by, sponsored by, or affiliated with “The Joy of Cooking” by Irma Rombauer or its publisher Simon & Schuster, Inc. For information about the “Joy of Cooking” publications and recipes, please go to The Joy of Cooking website or The Joy of Cooking at Simon & Schuster. Eggs Benedict fans, you’ll want to check out this new brunch at Foxsister in the Mission called Benedict, which features a variety of eight Eggs Benedict creations from chef-owner Brandon Kirksey, from the Italian Benny (prosciutto, rapini, garlic, chile, roasted tomato hollandaise, $15) to the Foxsister Benny (Korean fried chicken, scallion, spicy fermented chile hollandaise, $12). You also have the option to get a burger (kalbi-marinated shortrib, heirloom tomato, and daikon sprouts, on a sesame bun, for $14, and you can add an egg on that bad boy for $2), and bottomless mimosas and Bloody Marys for $18 (for 90 min. ), so it’s going to be a party, plus the DJs spinning music will add to the vibe. They also have a delicious frozé slushie. But don’t sleep in too late on this one, it’s only running through August 12th! (Pssst, you can reserve a table on OpenTable.) Fingers crossed they want to continue it. 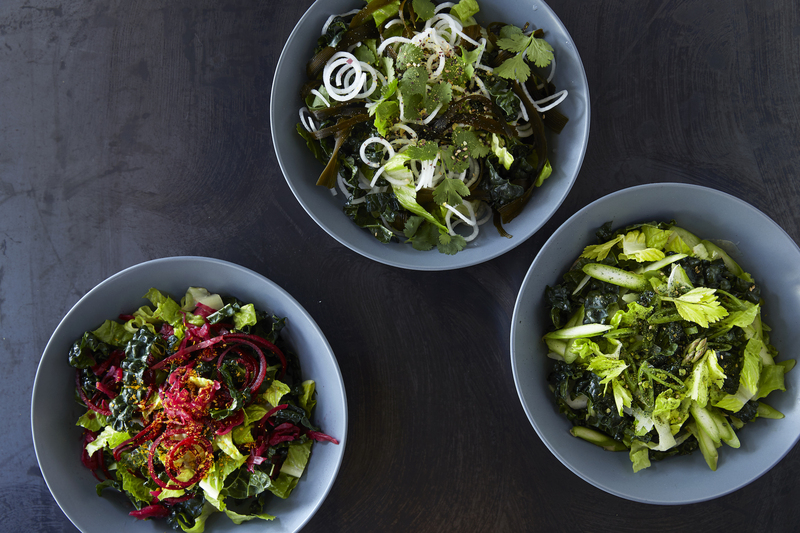 Summertime is in full swing (and if you live in San Francisco, hello, fog), and it’s also a favorite time for salads and eating lighter and hopefully healthier. 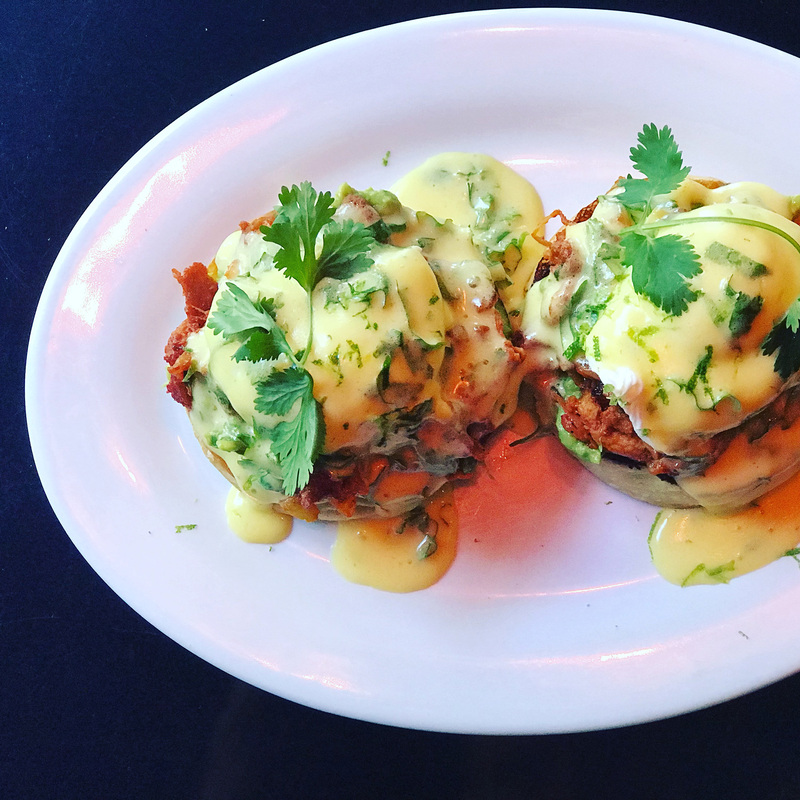 While many locals adore Green Chile Kitchen in Nopa for their New Mexico-inspired dishes, they may not know there’s a second business that runs out of their kitchen during the work week: Booster Foods Nutrition Kitchen. These nutrient-dense dishes were created in collaboration with GCK’s owner Trevor Logan and natural chef Wesley Monahan (they graduated from Bauman College’s Nutrition Consulting program together). Booster Foods offer interesting, healthy, and really satisfying dishes, especially when you’re feeling out of whack or just craving something healthy to eat (I love to eat here after traveling—I totally crave their vegetable-packed bowls). The menu uses gluten-free, locally sourced, non-GMO, and whole ingredients, listing the calories, fat grams, carbs, protein, and fiber, too. Yay, fiber. 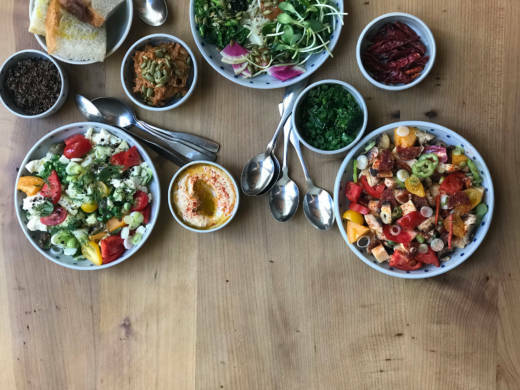 I’m a big fan of their salads ($14), especially the sauer (beets, sauerkraut, tempeh falafel, pepitas, kale romaine mix, citrus vinaigrette, and curried coconut with turmeric booster)—they come with these booster sides that you shake on for extra-healthy oomph and flavor. Try adding avocado or their fantastic tempeh falafel—I’m not kidding, it’s so good—to make the salads feel a bit more substantial for those of us who need a little something more. 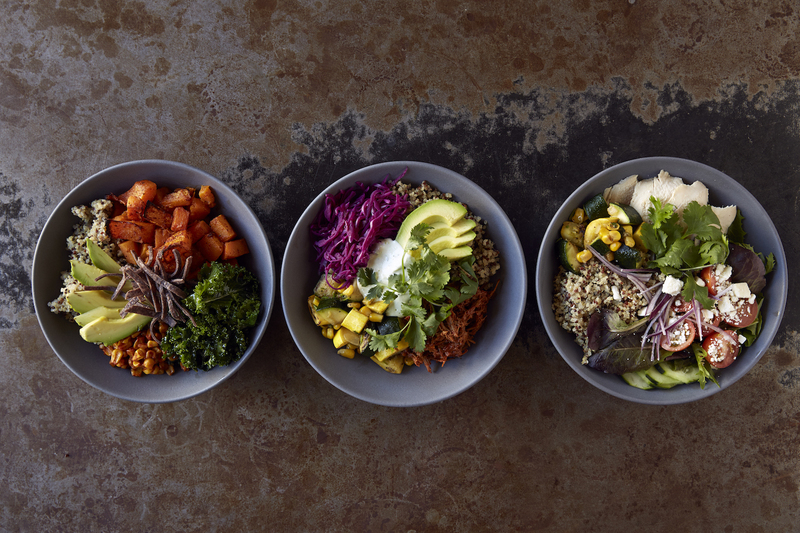 The balanced bowls ($16) are really fulfilling, which include ancient grains, fermented vegetables, roasted sweet potato, herbed yogurt, rainbow slaw, kombu, reishi immunity broth, and your choice of protein, from the gingered turkey meatball to that tempeh falafel. It’s the kind of food I wish I ate every day, you feel so good afterward. Their cauliflower crust pizzas are a hit with the gluten-free set (and you don’t have to be virtuous: the version with grass-fed beef, New Mexican green chile, gouda, and rainbow slaw with chile pepper booster is sooooo good), and the personal size pizza with a big side salad is a tremendous deal for $16—I almost couldn’t believe it when I got it delivered (and I had leftovers for the next day). You can also get Booster Foods delivered to your desk or home exclusively through Caviar (use this code on Caviar for $10 to use for each of your first two orders with them). But remember you can only order Booster Foods during the week.